Isabella is the fifth child and second daughter of Henry and Elizabeth (Armitage) Meinzen. She was born in 1880. It was a pleasant surprise to find an article about her wedding in a Steubenville newspaper. While this article doesn't give me new information about Isabella it is an additional source for her marriage and it lists attendees at the wedding which may prove helpful in the future. Isabella's name had several variations during her lifetime including Marie Isabella, Isabelle, Marie Isabelle, Marie Isabel, Marie Belletto, Marie B., and Belle. To relatives she was Belle. emnized at the home of Mr. and Mrs.
Henry Meinzen on Wednesday, Nov.
mony was performed by the Rev. 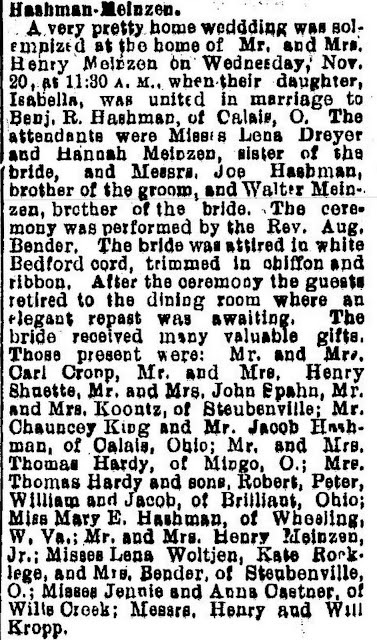 Aug.
Shuette, Mr. and Mrs. John Spahn, Mr.
and Mrs. Koontz, of Steubenville; Mr.
man, of Calais, Ohio; Mr. and Mrs.
Thomas Hardy, of Mingo, O.; Mrs.
A mid-week, 11:30 a.m. wedding seems unusual to me, but perhaps it's just the times in which I live when most weddings take place on Saturdays. This gives me a good idea of Belle and family's friends, neighbors, and possible relatives. It may be worth comparing who was at this wedding with who attended other weddings in the family. I try to imagine hosting this many people to a sit-down meal in my home and can not. It would have required immense effort considering that there was no refrigeration as we know it and cooking was probably done on a wood-burning stove. How many women worked to prepare this meal? The only siblings named as attendees were Belle's older sister, Hannah, and her brother and sister-in-law, Mrs. and Mrs. Henry Meinzen. Belle's younger siblings included Walter, 18; Mina, 15; Lula, 14; Bertha, 13; Robert, 11; Jacob, 7; and Naomi, 2. Did they attend the wedding? Several of the girls were old enough to help with preparations, serving, and childcare. Once again, I wish I had a photo of the young Isabella in her wedding gown with her husband, her bridal party, and her parents. This article, found at MyHeritage (but currently not available there) was published in the Steubenville Herald on November 29, 1901, page 6. Copyright © 2016 Nancy Messier. All Rights Reserved. Wow, what a find! Fun! Yes, I was surprised and pleased to find it, Brenna. Funny---I just attended a mid-week wedding yesterday. Some couples do it so they get in the entire weekend in their honeymoon, but it does require that everyone else take time off. I too wish you had pictures. I know many LDS couples marry during the week, Michelle, but I don't know of many couples of other religions who do. I never thought of it as an extra day for the weekend but that sounds right. Here places that rent for weddings are cheaper on Friday and Sunday than on Saturday, but I hardly ever see anyone marrying on those days. Midweek would be even more rare, and that's probably due to out-of-town guests who would be inconvenienced. As for the gown, I had to Google Bedford cord out of curiosity. I've been transcribing and indexing the day book of a tailor in Greene County, Virginia (1856-1867), so I can tell you all about other fabrics. So far Bedford cord has not come up. Apparently it resembles corduroy but isn't. It is, however, very durable, making it sound rather heavy and therefore appropriate for November. I would like to see a photo too, just to see how the chiffon was used. Do you think they had an actual meal or maybe finger sandwiches and cake? I have other ancestors who married during the week, too, so I suspect that it was more common to have weekday weddings in the 1800s and early 1900s. I'm surprised that I didn't think to look up Bedford cord, Wendy. After your comment, I did, and find that I wonder just how thick the fabric was in her dress, and how formal or informal it looked. Definitions suggest it may have variations between fine and coarse. I suspect that Isabella's mother would have made the dress but I don't have any way to know that. Your transcribing work sounds so interesting. You no doubt know lots about mid to late 1800s fabrics and their uses. I looked up "repast" and it suggests a meal or a feast, but it could have been lighter food. One of Belle's brothers married a few years after her. His wedding announcement read, "a nice wedding supper was served, covers being laid for twenty-five." So who knows. Either way I imagine a bustle in the kitchen in the days and hours before the wedding. Thanks for visiting and leaving such insightful comments and questions. I appreciate it.